Soroptimist International of Raleigh, NC was awarded the “Sisterhood Award” by Dress for Success Triangle NC, Dress for Success Worldwide CEO, Joi Gordon, presented the award at the 2010 The President’s Award reception held at Parker Poe Adams and Bernstein in Raleigh. Raleigh, NC (December 2010) – Soroptimist International of Raleigh, NC was awarded the “Sisterhood Award” by Dress for Success Triangle NC, Dress for Success Worldwide CEO, Joi Gordon, presented the award at the 2010 The President’s Award reception held at Parker Poe Adams and Bernstein in Raleigh. The board and staff of Dress for Success Triangle NC recognized corporations, nonprofit partners and individuals for the key role each has played in helping the organization in building operations in the Triangle. The “Sisterhood Award” is awarded to an organization who has a shared focus in improving and enriching the lives of women in the Triangle. The members of Soroptimist International of Raleigh, NC (Soroptimist) were selected due to their longstanding commitment to improve the economic conditions of women. Since late 2003, Soroptimist’s Professional Clothing Closet (the “Closet”) has been serving Wake County women in need of employment. The “Closet” opened in partnership with five Wake service agencies with a goal of providing a centralized clothing resource to those who wanted to work but for whom a lack of interview and work-appropriate clothing was an obstacle. In 2009, Soroptimist International of Raleigh, NC and Dress for Success Triangle NC merged their clothing operation. The Soroptimist Professional Clothing Closet is now the Raleigh Branch of Dress for SuccessTriangle NC. In addition to the suiting services, clients now have access to a wealth of additional Dress for Success services and resources. These expanded services include an on-site Career Center and a local Professional Women’s Group for on-going support. Soroptimist is an international volunteer organization of business and professional women. The name, Soroptimist, means “Best for Women.” The mission of Soroptimist is to improve the lives of women and girls in local communities and throughout the world. Soroptimist International of Raleigh, NC, chartered in 1987, is a 501(c)(3) organization solely run and operated by volunteers. 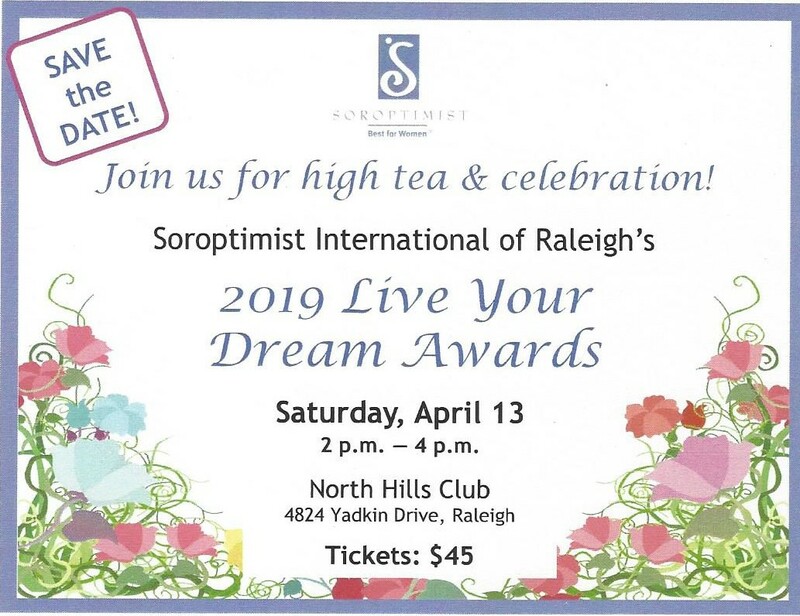 Locally, Soroptimist is focused on helping women achieve economic independence, ending domestic violence against women and their Triangle Women of Distinction Awards. Dress for Success is an international not-for-profit organization that promotes the economic independence of disadvantaged women by providing professional attire, a network of support and the career development tools to help women thrive in work and in life. Dress for Success Triangle NC responds to the needs of our communities by providing programs that help economically disadvantaged women acquire jobs, retain their new positions and succeed in the mainstream workplace. Visit www.dressforsuccess.org/trianglenc to learn more.